My day on March 25th went something like this — wake up at 3:45 am, go to work for 5:30 am, leave work at 2:30 pm and then drive an hour north to Nashua, New Hampshire, to participate in the first Steampunk Industrial Revolution. 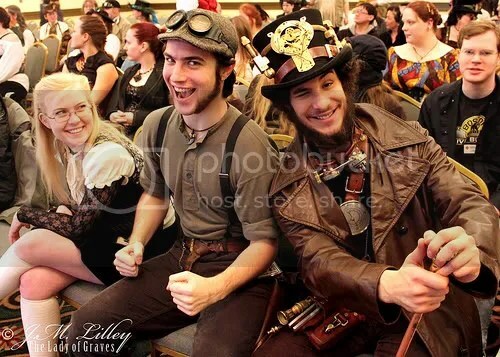 Held at the Holiday Inn on Northeastern Boulevard in Nashua, Steampunk Industrial Revolution was a fantastically busy cornucopia of awesomeness. I was the speaker for two of their events, the first on whether Historical Accuracy is necessary in Steampunk and the second was a repeat of my Roots of Steampunk presentation that I gave in South Carolina back in November. My historical accuracy panel was set after a panel discussion led by the A.S.S. Titilis and ACNSB, which had a fairly packed audience; the guys up front were supremely entertaining. And then my time slot began … and I was left with a single audience member. Incidentally, that single audience member was the talented Miss Monique Poirier, who you might remember was featured in my short-lived Ladies of Steampunk series over at Doctor Fantastique’s Show of Wonders. The lack of audience was due to me being up against three other panels — Military Steampunk, Victorian Japan, and Professor Marvel’s Moving Pictures. 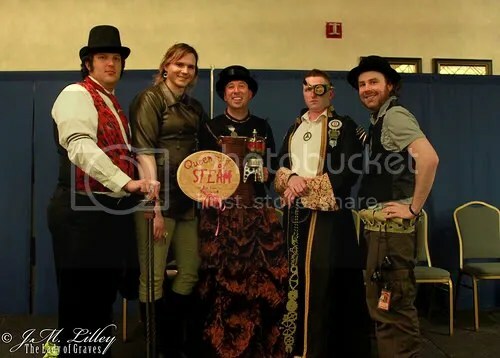 Steampunks at SIR. Image courtesy of Jessica Lilley. I loved my experiences at SIR that weekend — getting to meet Monique in person was awesome, and I hung out with Leanna Renee Hieber, bestselling author of The Strangely Beautiful Tale of Miss Percy Parker and The Darkly Luminous Fight for Persephone Parker. Leanna’s also an unrepentant fan of the classic Doctor Who series, which makes her even more awesome, and Monique is hysterically funny when she gets going. I also met one Austin Sirkin, a grad student at Georgia State, who had some very fascinating things to say about Steampunk as Alternate History and vice versa. The Queen of Steam drag fashion show was as entertaining as I’d hoped, even though I managed to only catch the back end of the event. Sadly I didn’t see the second fashion show on Saturday, so I can’t speak to that particular showcase. However there were a good number of well-dressed attendants roaming around the Holiday Inn that weekend so I’m sure it was good as well. All in all, it was a fantastic experience to be had so close to home for me. If I had to give any sort of negative at all, it’s that there were almost too many choices for things to do. I looked at the schedule again, and there are some time slots where six events were happening at once. It felt very much like they’d scheduled performers and presenters in numbers you’d expect to see at an event three times the size that Steampunk Industrial Revolution was. That said, I very much applaud them for thinking big — I hope that next year or the year after when I go again I will see the attendance grow by that much. In that respect, I have to end with kudos to Lucretia and Lisa for doing the bang-up job they did. Matthew Delman is the Chief Editor/Founder of Doctor Fantastique’s Show of Wonders. He writes a “practical literary guide” to Steampunk at the blog Free the Princess, and is the Managing Editor of Steampunk&Company (an Imprint of Flying Press LLC). 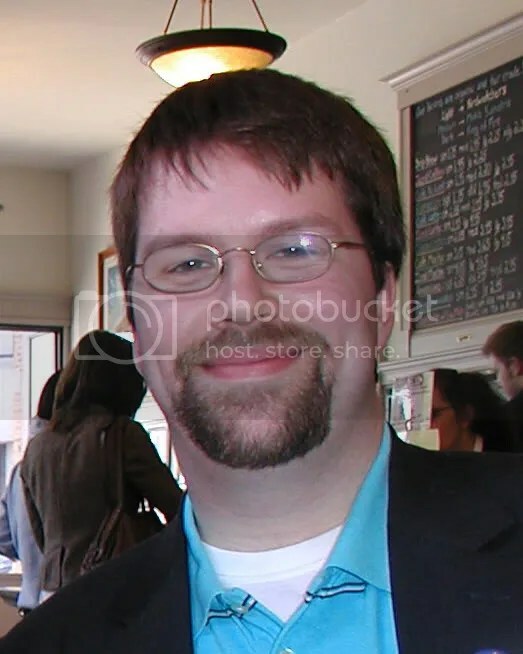 Matthew is based in Eastern Massachusetts, from where he also writes on travel in the Eastern U.S. and other topics.